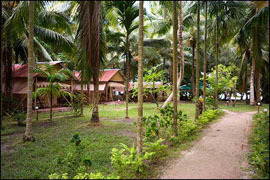 Island Vinnie’s Tropical Cabanas and Dive Center is based on the Havelock Island. It is a full service dive center and resort based in the Andaman Islands, India, and offers a total experience for the visiting diver – professional dive operations, comfortable accommodation, assistance with travel and logistics in the Andamans and serious value for money. The Resort organizes daily scuba diving trips to the best sites of the Andaman and Nicobar Islands. If you have not decided yet or wants to customize tour itinerary or hotels listed above in "Book Island Vinnie’s Tropical Cabanas Package, Havelock Island", then we can change the travel itinerary and make a personalized, tailor-made holiday package, especially for you. We can modify this travel package as per your itinerary, budget, duration and the tourist places you would like to visit, including transportation and airfare should be included or not. Please fill the form below to contact us.